Otosclerosis is a genetic disease (autosomal dominant inheritance) that affects the middle and inner ears. It consists of an abnormal bone growth called "otospongiosis". The abnormal bone grows around the third bone in the middle ear, the stirrup (stapes) and causes it to stop vibrating. As the vibrations decrease, hearing loss develops. 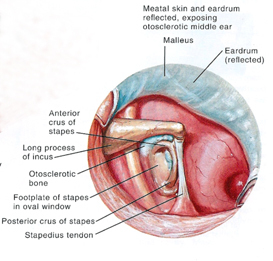 The hearing loss may be reversible by removing the stapes bone (stapedectomy operation). The abnormal otospongiotic bone may also grow around the cochlea and causes sensori-neural hearing loss that is not reversible. In order to understand otosclerosis and stapedectomy, it is necessary to understand how the ear works. Sound travels through the ear canal to the eardrum. The eardrum and the three small hearing bones transmit sound vibrations through the middle ear to the inner ear. The vibrations cause fluid within the inner ear to stimulate outer and inner hair cells within the inner ear. The hair cells then transmit sound as electrical signals to the brain. The inner ear and brain enable sounds to be heard and words to be distinguished clearly. Otosclerosis is a disease of bone that is limited to the third hearing bone, the stapes, and the bone surrounding the inner ear (cochlea). In the early stages of the disease, otospongiosis, areas of "softened" bone appear, particularly around the front portion of the stapes. The soft patches of bone contain chemicals (enzymes) that are capable of dissolving bone. With time, the bone destruction stops, and the otospongiotic bone hardens (calcifies). 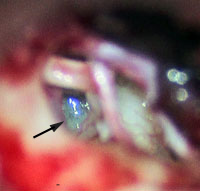 In non-obliterative otosclerosis, the stapes footplate has a "blue" appearance in contrast to the normal yellow-white color of the normal footplate. right ear, low power view. Ossicles: The chain of three small hearing bones within the middle ear are called the ossicles. The third bone in the chain, the bone nearest the inner ear, is shaped like a stirrup and is called the stapes (pronounced "stay-peas"). Otosclerosis is a growth of abnormal bone around the stapes. As the otosclerotic bone slowly grows and hardens around the stapes, the movement of the stapes is impaired. Eventually, the stapes is unable to move and cannot conduct sound vibrations to the inner ear. The result is a decrease in hearing called a "conductive hearing loss". With time, the otosclerotic bone becomes more dense, hearing loss increases, and the hearing nerve function can be damaged by a toxic substance that is produced by the otosclerosis. Medical treatment can sometimes prevent this type of hearing loss from getting worse, but it cannot reverse the nerve damage. Rarely, otosclerosis can cause total deafness. If left untreated, some patients can develop severe hearing loss from "far advanced otosclerosis". Inherited: Otosclerosis is a genetic condition, occurs in families (autosomal dominant transmission with variable penetrance), and occurs more often in certain ethnic groups. For instance, otosclerosis is more common in northern Europeans than in African Americans or Asians. Approximately 5% of all people with hearing problems have otosclerosis. Although otosclerosis is inherited, the fact that one has otosclerosis does not necessarily mean that one's children will develop clinical symptoms of hearing loss. All the children of affected parent(s) will have received the genes for otosclerosis, but they may not develop clinical hearing loss. The trigger for otosclerosis is not known. Diseases such as scarlet fever, measles, or influenza do not cause otosclerosis. Exposure to noise is not a cause. The only bone in the body that is affected by otosclerosis is the bone that contains the ear. Other bones in the body are not affected. No one has ever become sick or died from otosclerosis. Our current understanding of otosclerosis is incomplete. We know that most bone in the human body is continually being broken down and repaired. Such mechanisms are regulated by bone enzymes. Normally, the bone enzymes in the inner ear are suppressed because the bone of the inner ear never grows after birth. However, in otosclerosis, new, abnormal bone does grow. Therefore, we think that otosclerosis may involve a dysinhibition of inner ear bone enzymes. Importantly, and contrary to much of the world's literature, otosclerosis does not become worse during pregnancy. In fact, there is evidence that pregnancy may help to lessen the condition. Dr. William Lippy of the Lippy Ear Group in Warren, OH needs to be thanked for his pioneering clinical work on this topic. Women who have otosclerosis or who have a parent with otosclerosis may pursue pregnancy without worrying about whether their hearing will deteriorate during pregnancy. People with otosclerosis are born with the condition. The disease slowly progresses throughout life. The first manifestations of the disease begin to occur in the late teenage years or early twenties, progresses during the thirties, and often becomes clinically significant during the forties. Although gradual progression is the rule, periods of accelerated hearing loss may occur. Otosclerosis usually affects both ears, although unequally.The natural history of untreated otosclerosis is variable. Most people's hearing stabilizes at moderate to severe levels of hearing loss. Total deafness may occur but is rare. Two types of hearing loss occur with otosclerosis: (1) conductive, and (2) sensorineural. Often, otosclerosis will lead to a combination of both types which is referred to as a "mixed hearing loss." Conductive hearing loss results from the mechanical effects of otosclerosis on the stapes which becomes progressively fixed and unable to vibrate freely. With an operation called a "stapedectomy", the conductive component may be correctable. Sensorineural hearing loss results from the effects of otosclerosis on the inner ear and is irreversible. Patients with mixed hearing loss may need to wear hearing aids even after a successful stapedectomy operation(s). Hearing loss from otosclerosis is usually of gradual onset in one or both ears. Ringing, buzzing, or ear noises (tinnitus) may be caused by otosclerosis. The tinnitus is due to the otosclerotic toxins that may damage the inner ear's sound sensing cells or the hearing nerve. Nerve impulses may be generated even though no sound is entering the ear. The tinnitus caused by otosclerosis may improve after surgery or may persist in some patients. Intermittent, fleeting dizziness or vertigo which lasts a few seconds may be caused by otosclerosis. When it occurs, it is referred to as "otosclerotic inner ear syndrome" and was first described by Brian McCabe, M.D. at the University of Iowa. Surgery usually relieves the symptoms of otosclerotic inner ear syndrome. The medical treatment of otosclerosis is designed to slow down or stop the damaging effects of the disease process on the inner ear sensing cells and prevent further sensorineural hearing loss. Currently, there is no medical treatment that can repair existing inner ear damage or reverse sensorineural hearing loss. Research called "auditory regeneration" is being studied but has only been accomplished in laboratory animals, not humans. Therefore, the goal of medical treatment is to prevent future damage and stabilize hearing levels. Fluorical: At present, fluoride medications are being used to treat otosclerosis. The fluoride is combined with calcium (fluorical) because fluoride can cause the body to lose calcium. The medication must be combined with taking one daily multivitamin with vitamin D to help with calcium absorption. To be effective, the fluorical must be taken at least twice a day and sometimes three times a day. Many patients are placed on fluorical for their lifetime. The presumed action of the fluoride is to convert the active bone-destroying otospongiotic lesions into inactive otosclerotic lesions. Side effects of fluoride are minimal but may include stomach upset, increase in arthritis pain, and some kidney issues. The medication should be taken with meals to decrease the incidence of stomach irritation. People with stomach problems, significant arthritis, and kidney disease should not take fluorical. Pregnant women and children should not take fluorides. One hope is that a better fundamental understanding of otosclerosis from a bone metabolism standpoint will lead to new medications to treat the disease. At present, there are no medications that can "loosen" a "fixed" stapes bone. The solution of the mechanical problem is a mechanical solution - surgery i.e. an operation called a "stapedectomy". Alternative treatments include conventional hearing aid amplification, BAHA osseointegrated implants, or no treatment. All patients with otosclerosis are encouraged to try hearing aids prior to having a stapedectomy operation. Dr. Kraus has been performing stapedectomies in Greensboro since 1983. He is one of 130 members of the Otosclerosis Study Group (OSG) of the United States. The OSG meets once a year at the AAO-HNS Annual Meeting to discuss the latest information concerning otosclerosis and its management. In a majority of people with otosclerosis (90-95%), the conductive hearing loss caused by otosclerosis can be reversed through an operation called a "stapedectomy or a stapedotomy". The stapes is a very small bone measuring approximately 2mm x 4mm. Stapes surgery requires the use of an operating room microscope and sophisticated surgical techniques. The procedure is usually performed by ear surgeons who have had special training performing stapes surgery. The procedure was attempted in the 1870's and was re-popularized in 1956 by Dr. John Shea, Sr. of Memphis, TN. Dr. Shea used a polyethylene strut and a vein graft. Since the 1960's, stapes surgery for the treatment of otosclerosis has become widely practiced around the world. Various methods of removing all or part of the stapes have evolved over the years. Each technique has its own following. As with many surgical procedures, the technique is not as important as the results. In general, a portion of the stapes bone is removed and is replaced with a man-made prosthesis. The prosthesis is attached to the second bone, the incus. The procedure is performed through the ear canal. There are many different types of stapes prostheses currently in use. Dr. Kraus was fortunate to have been trained in stapedectomy by William H. Lippy, M.D. (Warren, OH) and Brian McCabe, M.D. (Iowa City, IA) Dr. Lippy, along with Mendell Robinson, M.D. and Carey Moon, M.D. were the three main surgeons who began using the Robinson prosthesis and vein graft technique in the early 1960's. Together, they performed over 50,000 stapedectomies. Dr. Lippy has performed over 18,000 stapedectomies. Drs. Robinson and Moon are deceased. Dr. Lippy invented the Lippy Modified Robinson prosthesis that is used when the lenticular process of the incus is absent and the incus has necrosed. 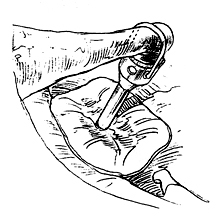 Exposure and Footplate Removal: At the Ear Center, it is Dr. Kraus's preference to perform a stapedectomy(removal of the posterior 2/3 of the footplate) rather than a stapedotomy (making a small hole in the stapes footplate). His technique involves removing the stapes superstructure (upper part of the stapes bone) and the posterior (back) 1/2 to 2/3 of the stapes footplate, with a CO2 laser. The laser that is used is an Omniguide CO2 laser with a BeamPath OTO-S fiber. The wave guide fiber is hand-held. Using the stapes handpiece, the spot size at near contact is 0.25mm. Single pulses of CO2 laser light at settings of 2-6 watts are used at 100 msec (0.1 sec) pulse durations. A pressure of 0-10 psi of Helium gas pressure is used to clear and cool the target tissue. The Omniguide hand-held laser fiber is extremely useful during revision stapedectomies. Use of the laser permits precise vaporization of tissue without mechanical trauma. 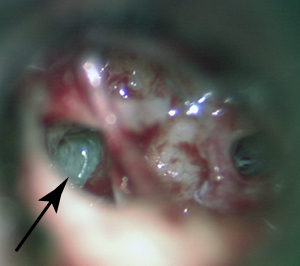 Right middle ear showing otosclerosis around the stapes footplate. (usually, only the posterior 1/2 of the footplate is removed in the technique used by Dr. Kraus). *Images from: Ciba-Geigy, Clinical Symposia 1992;44(3):23-24. Robinson Technique: A vein graft (harvested from the lower forearm) is used to cover and seal the oval window, prevent leakage of inner ear fluid (perilymph fistula), and produce a trampoline effect for the prosthesis. Using a two-handed technique (the use of a speculum holder is recommended) with an incus hook and strut guide, a 4.0 mm titanium Robinson cup prosthesis is attached to the incus and rested on the vein graft in the oval window. The Robinson prosthesis self-centers itself in the oval window. There is no tension. During healing, tissue grows into the holes in the shaft and well of the prosthesis. 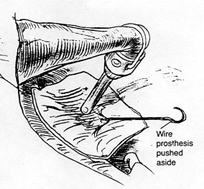 The wire keeper is used to help secure the prosthesis on the end of the incus (lenticular process). MRI Scans: By using a titanium prosthesis to replace the stapes, the patient may have MRI scans in 1 or 1.5 Tesla MRI scanners. (It is important to know the type of stapes prosthesis that has been implanted in your ear. Allways check with your radiologist prior to undergoing any type of MRI scan and notify them that you have a stapes prosthesis in your ear. They can check your prosthesis by manufacturer and inform you as to whether MRI scanning is safe with your particular type of prosthesis.) For more information, please see the references #2 and #3 below by M.H. Fritsch. 1. 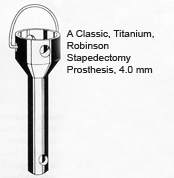 A classic Robinson stapedectomy prosthesis - now made of MRI safe titanium. Note the holes in the well and shaft for tissue ingrowth and the wire keeper for securing to the incus. 2. Right Ear: A Robinson prosthesis implanted over a vein graft with the wire keeper placed over the lenticular process of the incus. 3. Right Ear: A revision stapedectomy in which a previously implanted wire prosthesis has been removed from the incus (but not from the oval window), pushed aside, and a Robinson prosthesis is placed over a vein graph with a slit to accommodate the wire. Image 1 from AAO-HNS Bulletin, December 2007, 56. Images 2 & 3 from Lippy WH. Special problems of otosclerosis surgery. in Otologic Surgery. ed. by Brackmann, Shelton, Arriaga.WB Saunders:Philadelphia, 1994, 351. Right ear: Black arrow shows classic "blue" footplate of otosclerosis. The blue color is due to abnormal, increased vascularity characterisitic of otospongiotic bone. The posterior 1/3 of the footplate is white and thickened. In this patient, the posterior 2/3 of the footplate was removed using the Omniguide CO2 laser. Right ear (same patient): Titanium Robinson stapes prosthesis, large well/narrow shaft, placed over a vein graft that has been used to seal the oval window following 2/3 footplate removal. The chorda tympani nerve (nerve supplying taste to the anterior 2/3 of the tongue) has been preserved. Dr.. Kraus performs stapedectomies/stapedotomies at an ambulatory surgical center (SCA Surgical Center of Greensboro or at the Moses Cone Day Surgery Center) and use general anesthesia. The procedure takes 1-11/2 hours. Patients are kept overnight at the ambulatory surgical centers for 23 hrs. of bed rest and observation. Patients return in 7-10 days for suture and ear canal packing removal and return again at 6 weeks, 6 months, 12 months, and then yearly to have their hearing levels tested. If both ears have hearing loss due to otosclerosis, the worst hearing ear is usually operated upon first. The second ear is operated upon 12 months later if the patient desires. Both ears are never operated upon on the same day. Most patients may return to work after one week of rest. Complete healing takes between one to three months. Hearing with the Robinson prosthesis usually steadily improves during the first six weeks as the body covers the prosthesis with a thin sheath. Patients are asked to keep their ear dry for six weeks, avoid heavy lifting or straining > 20 lbs., exercise, nose blowing, and airplane flying for three weeks. Hearing is improved following stapedectomy approximately 90% of the time. Hearing remains unchanged in approximately 7% and may be worse than before surgery in 1-3% of patients. Depending on preoperative hearing levels, it may or may not be necessary to wear a hearing aid after having a stapedectomy. If one's hearing nerve is normal before the operation, one may have normal hearing after successful stapedectomy. If one's hearing nerve in not normal before the operation, one may have better hearing after a successful stapedectomy but will still not have normal hearing. However, one may be able to hear in many situations without wearing a hearing aid but may need to wear a hearing aid under other conditions. In such a case, one usually benefits more from the use of a hearing aid, but one still needs to wear a hearing aid. Dizziness, either transient or prolonged, may occur after stapedectomy/stapedotomy because the inner ear plays a role in both hearing and balance. Prolonged dizziness is rare. Some unsteadiness, especially with quick head turns or when getting out of bed for the first few times, is common during the first few postoperative days. Dizziness with rapid head motion may persist for several weeks until the inner ear adjusts to the operation. On rare occasions, the dizziness may be prolonged and may require additional surgery (granuloma formation, etc.). 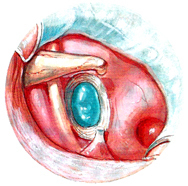 Otosclerotic inner ear syndrome is usually improved by stapedectomy. Tinnitus or ear ringing is usually unchanged or lessened after stapedectomy. On rare occasions, tinnitus may be worsened, especially if the hearing has not been improved or has become worse. A temporary taste disturbance is common after stapedectomy/stapedotomy. The disturbance is usually reported as a "tinny" or "metallic" taste. The taste change is due to irritation, stretching, or sacrifice of a taste nerve that runs through the ear called the "chorda tympani nerve". The nerve is located directly underneath the ear drum and is very near the stapes. Many times the nerve obstructs the surgeon's view of the stapes and must be retracted or sacrificed to provide adequate visualization of the critical stapes area. Because people have other taste nerves that provide sensation to the tongue, dysfunction of the chorda tympani nerve may produce a metallic or salty taste on one side of the tongue for up to several months. Prolonged change in taste is uncommon but may occur. 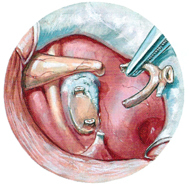 Perforations of the eardrum occur in less than 1% of patients who undergo a stapedectomy. Spontaneous healing usually occurs. In rare cases, an additional surgical repair may be required. Facial weakness (paresis) or paralysis is a very rare complication of stapedectomy. It may be immediate or delayed. The facial nerve is situated immediately beside the stapes bone. The nerve may not be covered by its normal bony covering and may, therefore, be exposed and more vulnerable to injury. Continuous electronic facial nerve monitoring is performed during stapedectomies/stapedotomies in order to provide the surgeon with information concerning the facial nerve. Transient facial weakness or paralysis is treated with steroid medication and usually resolves within a matter of days or weeks. Permanent facial paralysis is possible but is rare. Other complications are possible such as numbness in the area of the forearm incision vein graft site, postoperative infections, reactions to anesthesia, reactions to antibiotics, loose prostheses causing a vibration sound during talking or singing, prosthesis extrusion, ossicular necrosis (usually the long or lenticular process of the incus), other allergic reactions, etc. Such complications are rare and treatment is available. Lippy WH, Berenholz LP, Schuring AG, Burkey JM. Does Pregnancy Affect Otosclerosis? Laryngoscope, 2005, 115, 1833-1836. Fritsch MH, Gutt JJ, Naumann IC. Magnetic Properties of Middle Ear and Stapes Implants in a 9.4-T Magnetic Resonance Field. Otol Neurotol, 2006, 27(8), 1064-1069. Click here for a .pdf of the article. Fritsch MH. MRI Scanners and the Stapes Prosthesis. Otol Neurotol, 2007, 28(6), 733-738. Click here for a .pdf of the article. Cruise AS, Singh A, Quiney RE. Sodium Fluoride in Otosclerosis Treatment: Review. J Laryngol Otol, 2010, Feb. 18: epub ahead of print. Miller ME, Kirsch C, Canalis RF: Congenital familial fixation of the malleus. Annals ORL, 2010, 119(5); 319-323. Schrauwen I, Van Camp G. The etiology of otosclerosis: a combination of genes and environment. Laryngoscope, 2010, 120(6); 1195-1202. Thomeer GXM, Kunst PM, Cremers WRJ. Isolated congenital stapes anklyosis: surgical results in a consecutive series of 39 ears. Annal ORL, 2010;119(11):761-766. Wycherly BJ, Berkowitz F, Noone AM, Kim HJ. Computed tomography and otosclerosis: a practical method to correlate the sites affected to hearing loss. Annal ORL 2010;119(12):789-794. Ying Y-LM, Hillman TA. Patterns of failure in heat-activated crimping prosthesis in stapedotomy. Otol Neurotol 2011;32(January):21-28. Schimanski G, Schimanski E, Berthold MR. 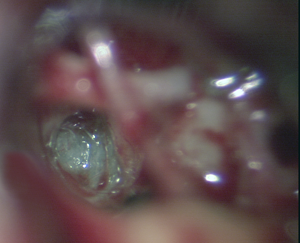 Diagnostic findings in stapes revision surgery - a retrospective of 26 years. Otol Neurotol 2011;32 (April):373-383. Malafronte G Filosa B, Barillari MR. Stapedotomy: Is the color of the footplate important in the choice of the type of perforator? Otol Neurotol 2011; 32 (September):1047-1049. Lachance S, Bussieres R, Cote M. Stapes surgery in profound hearing loss due to otosclerosis. Otol Neurotol 2012;33 (July):721-723. Vincent R, Bitttermann AJN, et al. KTP versus CO2 laser fiber stapedotomy for primary otosclerosis: resultsof a new comparative series with the otology-neurotology database. Otol Neurotol 2012:33 (Aug):928-933. Karosi T, Csomor P, Sziklai J. The value of HRCT in stapes fixations corresponding to hearing thresholds and histologic findings. Otol Neurotol 2012;33 (October):1300-1307. Carlson ML, Van Abel KM, et.al. Outcomes comparing primary pediatric stapedectomy for congenital stapes footplate fixation and juvenile otosclerosis. Otol Neurotol 2013;34 (July):816-820. If you would like to learn more about the otosclerosis, treatment options, and stapedectomy/stapedotomy, please contact our office at (336) 273-9932.